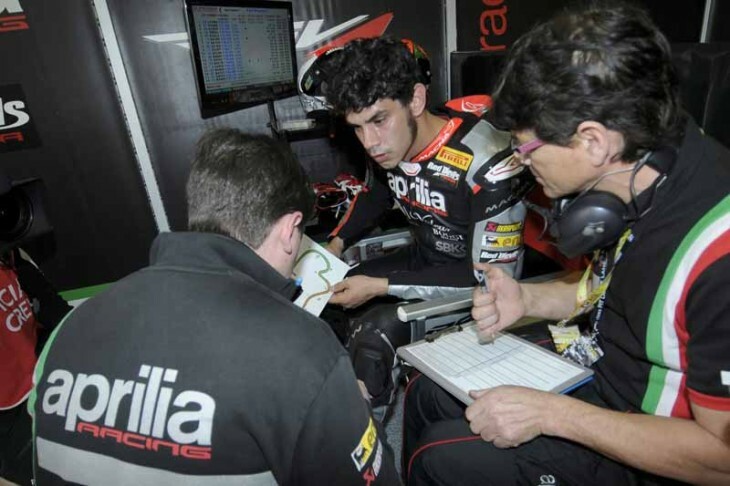 The feeling of this Friday practice at Phillip Island is summed up in the words of Romano Albesiano, Aprilia Racing Manager. This Sunday on the exciting Australian track the World SBK championship will kick off with Aprilia defending the double championship title (Rider and Manufacturer) won last season. Spaniard Jordi Torres and English rider Leon Haslam, both in the first official year on the reigning world champion bikes, definitely got off on the right foot and rode their RSV4 RFs to the top part of the standings. Respectively second and fourth in the combined standings for today’s sessions, they were consistently among the front-runners, even finishing the second session this afternoon with Torres leading and Haslam second. But it was not just a battle against the clock. In fact, the Aprilia Racing – Red Devils riders focused on fine tuning their bikes, completing all the scheduled tasks and even testing various setups and materials with a view to Saturday’s Superpole session and, above all, the races on Sunday.